On Friday, Nov. 16, Fayette High School and Wauseon High School held an OHSAA sponsored Foundation Basketball Game involving the varsity girls and varsity boys teams from both schools. Revenue generated from the games allowed the two schools to be able to make a donation of $1,153 to the Lion’s Club to go toward the Juvenile Diabetes Research Foundation. 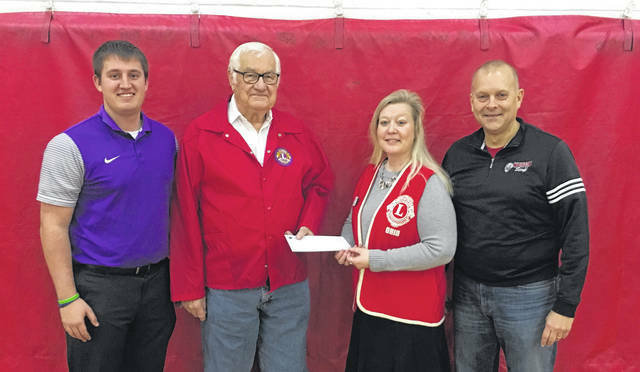 Pictured making the donation are, from left: Dylan Henricks, Fayette High School Athletic Director; Lowell Beaverson, Fayette Lion’s Club President; Christy Shadbolt, Wauseon Lion’s Club President; and Matt Hutchinson, Wauseon High School Athletic Director. Since 2008, Foundation Games across Ohio have generated over $500,000 for charitable organizations state-wide.